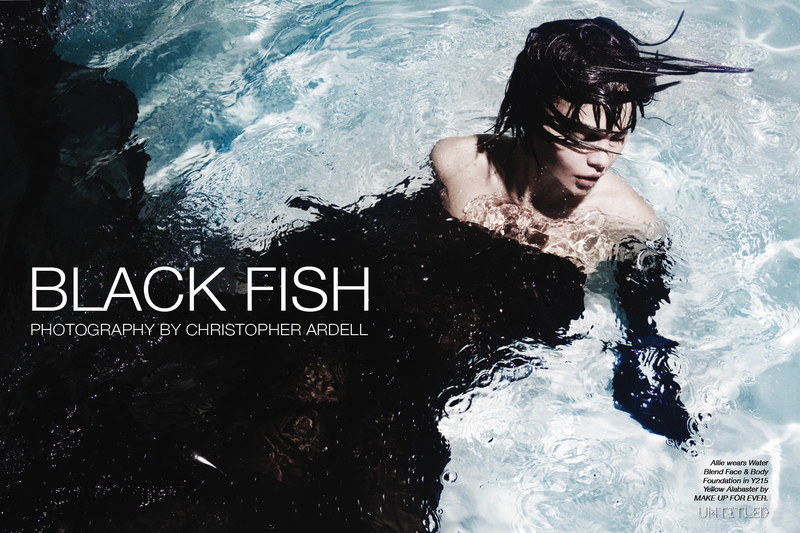 Black Fish – The Untiled Magazine – Photography by Christopher Ardell. Allie wears Water Blend Face & Body Foundation in Y215 Yellow Alabaster by MAKE UP FOR EVER. Left page: Allie wears Le Vernis Nail Polish in 538 Gris Obscur by CHANEL and Aqua Brow in 40 Brown Black by MAKE UP FOR EVER. Right page: She wears Artist Rouge Mat Lipstick in M500 Wine Violet by MAKE UP FOR EVER, crystal nails designed by SHIKEGO TAYLOR, and hair products by ORIBE. Allie wears Water Blend Face & Body Foundation in Y215 Yellow Alabaster, Aqua Matic Waterproof Glide-On Eyeshadow in M11 Matte Black, and black Waterproof mascara by MAKE UP FOR EVER. Turtleneck by H&M.